The newly named Cardiff International Hotel was formerly known as the Quality Hotel. 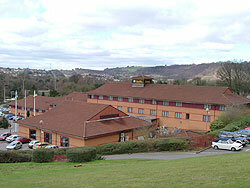 It is conveniently located just off junction 32 of the M4 motorway and contains a total of 95 guest rooms. Cardiff city centre and the Millennium Stadium are approximately 15 minutes away by car. Castell Coch is within walking distance in the nearby village of Tongwynlais. Hillside Restaurant serves a hot buffet selection and a la carte menu of English and international dishes.